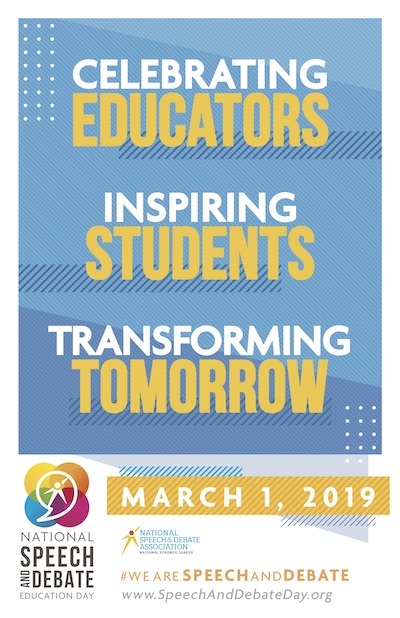 Save the Date—March 6, 2020! Sign up below to send a special message to your teachers and administrators! Our forms close February 22, 2019. 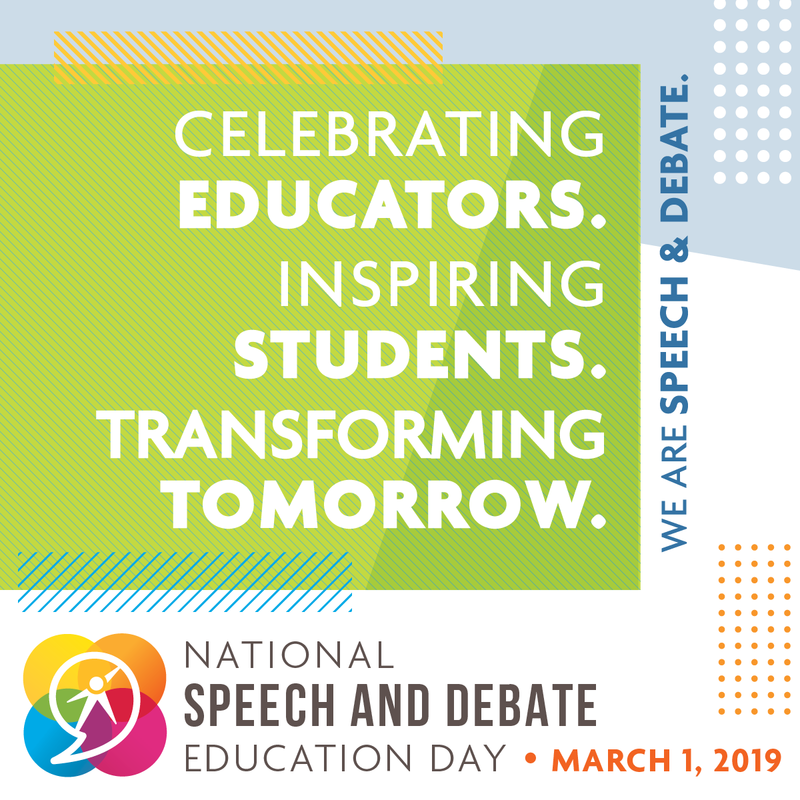 We will share your notes of appreciation on National Speech and Debate Education Day (March 1, 2019). Download our guide to celebrating National Speech and Debate Education Day! 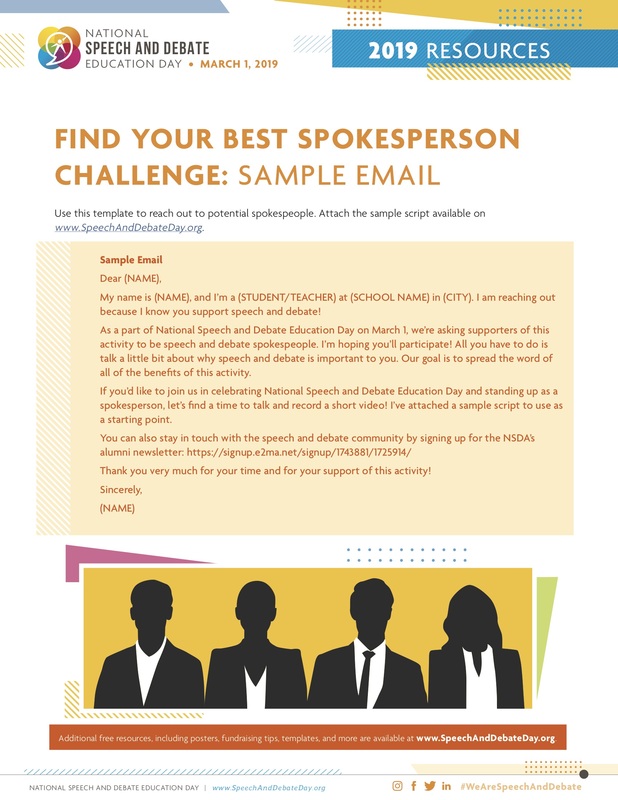 Download our posters, including this year’s student poster designed by Uzo Ngwu from Apple Valley High School in Minnesota, for use in promoting National Speech and Debate Education Day. 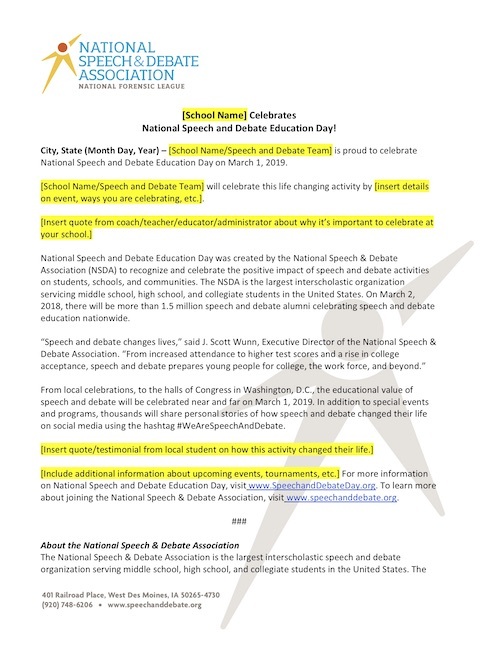 Amplify your team’s National Speech and Debate Education Day celebration by making sure everyone hears about it! 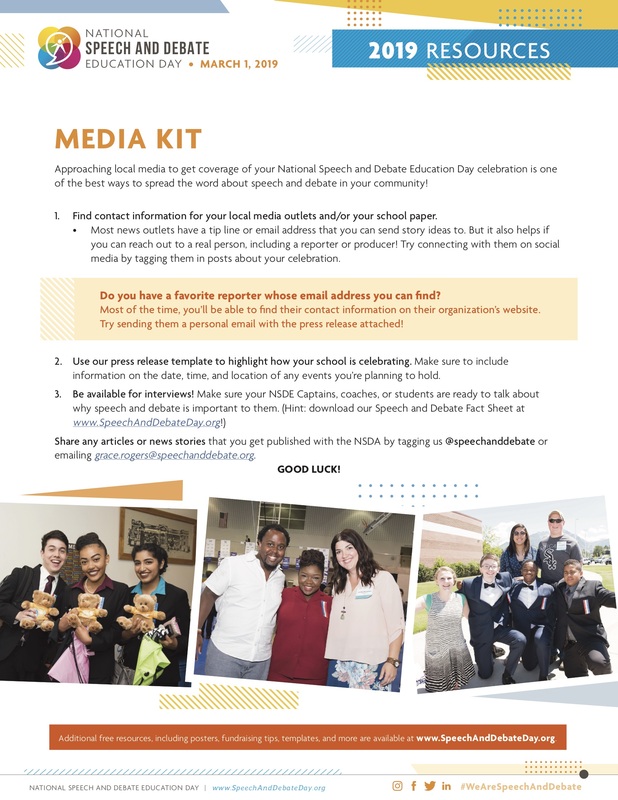 Learn more with these free resources on social media and contacting local traditional media. 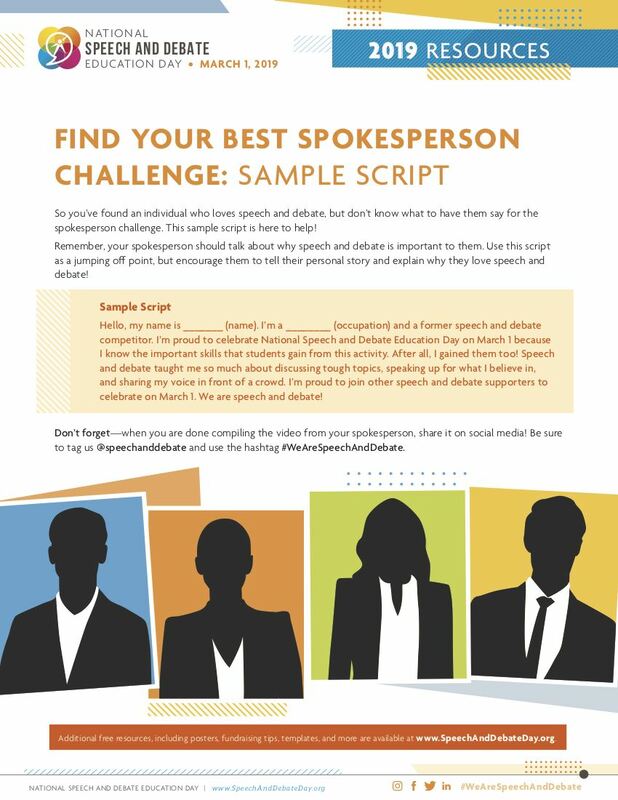 The more people talking about National Speech & Debate Education Day, the better, which is why we’re challenging all of our 2019 participants to recruit their best spokesperson for NSDE Day! 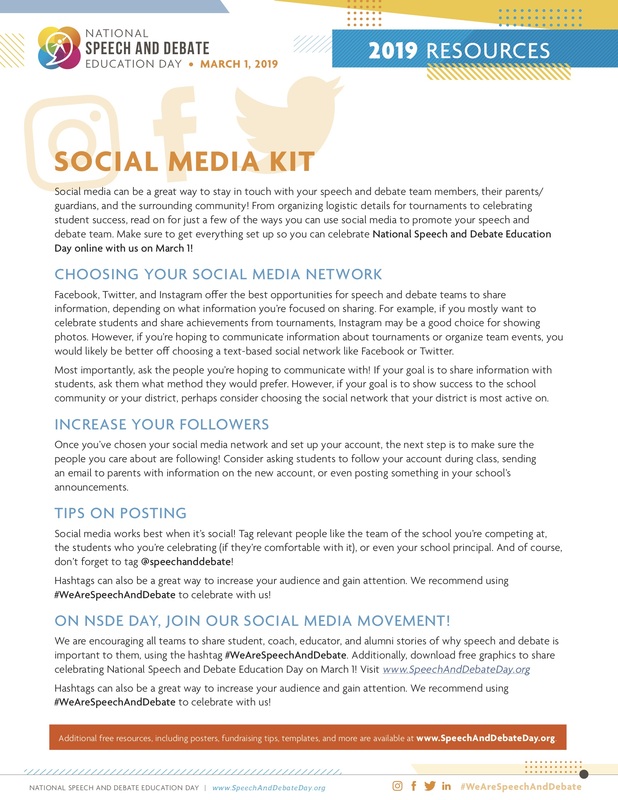 Don’t forget to tag us on social media @speechanddebate and use #WeAreSpeechAndDebate when you post your spokesperson’s statement. 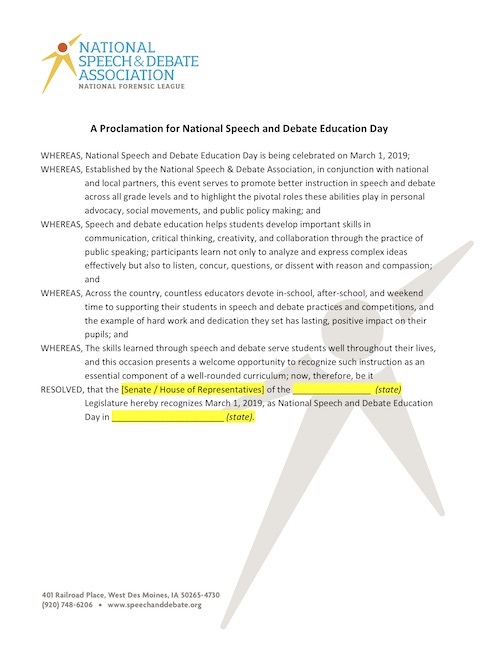 Work with your local elected officials to pass a proclamation or resolution declaring March 1, 2019 as National Speech & Debate Education Day! We have all of the resources you need to do it, including an email template to contact your elected officials, a sample resolution, and a sample proclamation. 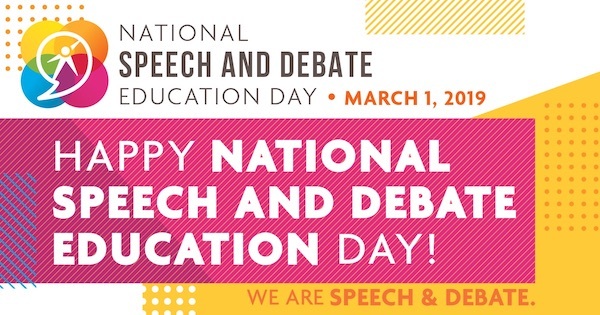 Make National Speech & Debate Education Day a welcoming celebration for everyone! 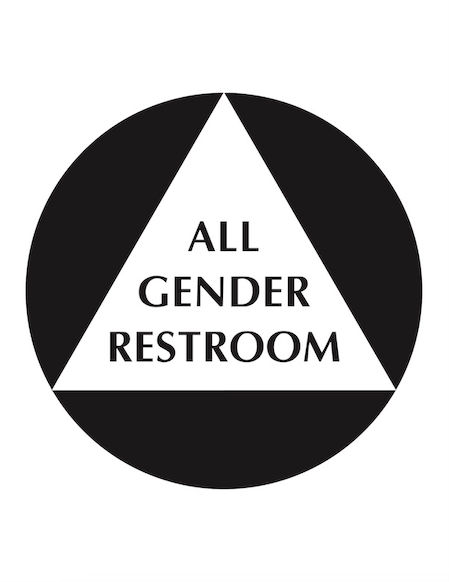 Learn more about our commitments to inclusion and diversity, and find even more resources by clicking here. Promote speech and debate in your community by showing others the value of this incredible activity. 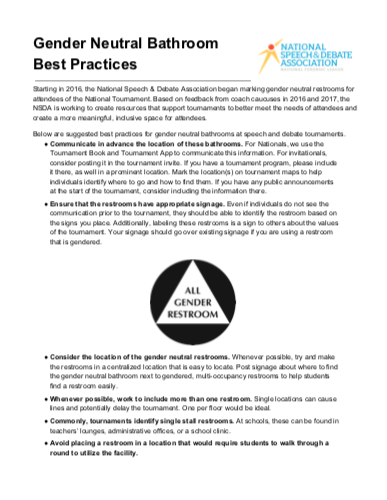 Invite administrators or local officials to a tournament, or show them the benefits of speech and debate using our collection of articles! 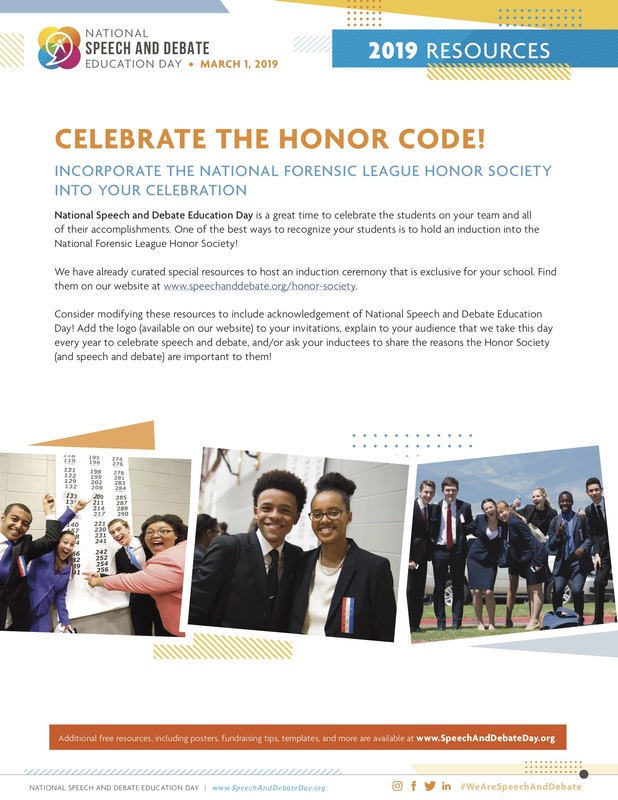 The National Forensic League Honor Society is one of the oldest and largest honor societies in which students can earn recognition. Celebrate the achievements of your students outside of competition by holding an induction ceremony! 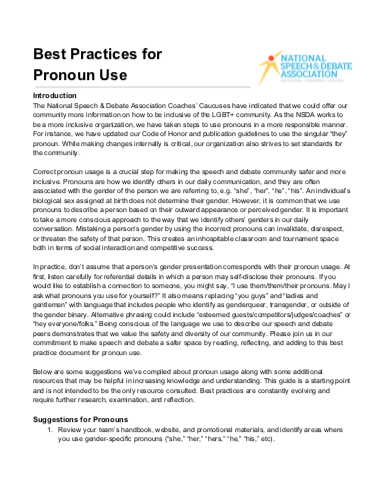 Read the guide below and find more resources here. Download our social media graphics and official logos for use in promoting National Speech and Debate Education Day. 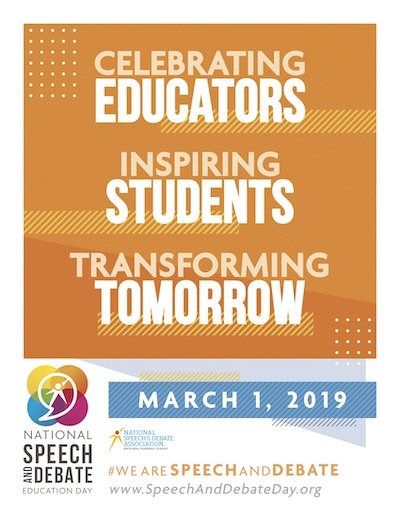 We encourage schools to schedule an event on March 1, 2019, in recognition of teachers and students who are transforming tomorrow through speech and debate education. Get inspired below! 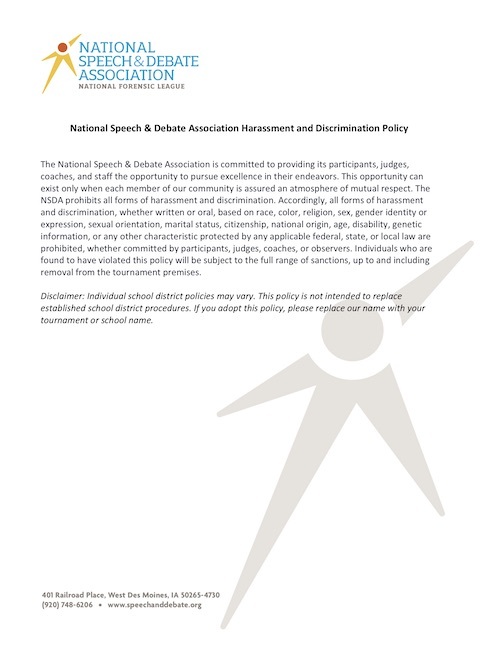 Classroom Activity #1 – Students prepare a presentation for their class by taking a topic of their choice that is related to the content of the class and offering insights on an issue of concern, with potential changes to address the situation. Celebrate Expression Assembly – An assembly where students are afforded an opportunity to express themselves through spoken word poetry, an oratory, an extemp speech, or a debate. After each performance, audience members could be given the opportunity to ask questions about the message—why they framed their opinions the way they did; how they chose what to perform; what motivated them to speak. Guest Speaker Assembly – The school arranges for a guest speaker to come in and talk about an issue of significance to the student body. That speaker could be anyone. In fact, if the speaker isn’t already a renowned speaker, they embody the theme of “unexpected voices.” At some point, the speech or speaker should touch on how students can use their voice to affect change. The opening speech should also be a chance for the student leader to offer a 5-10 minute State of the School speech. Once the speech is over, the event would be turned over to the principal. The principal would make some opening comments and then start the town hall. 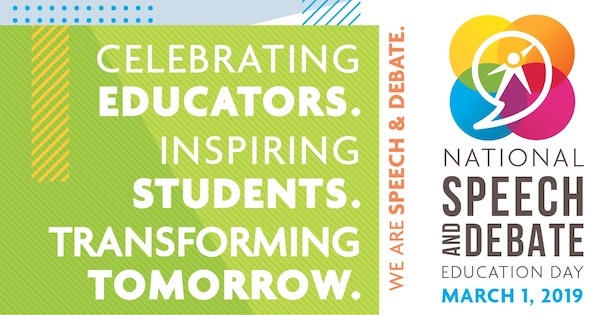 Celebrate with Mentorship – Recognize National Speech and Debate Education day by planning a day of mentorship for your program. 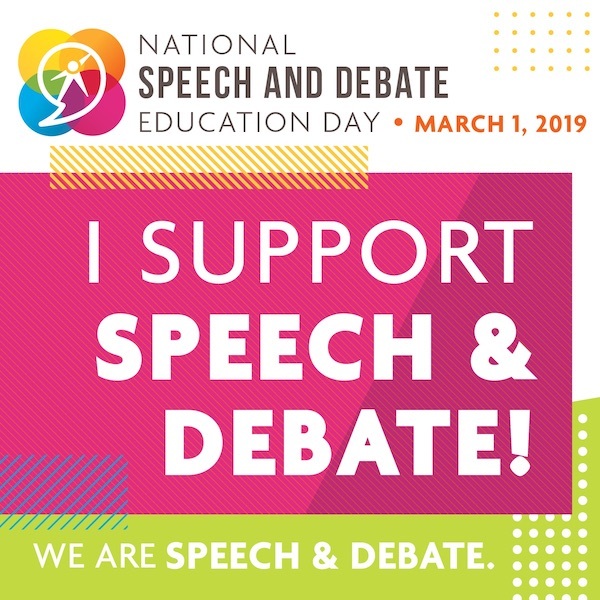 To get started, reach out to teachers in local elementary schools or middle schools that don’t have existing programs, and celebrate the day by introducing speech and debate to a new generation. Inspire them to speak up, engage, and think critically. Host a Showcase and Meet the Team Event – Teachers, students, and alumni can work together to open the doors of their program to the community with a Speech and Debate Day. 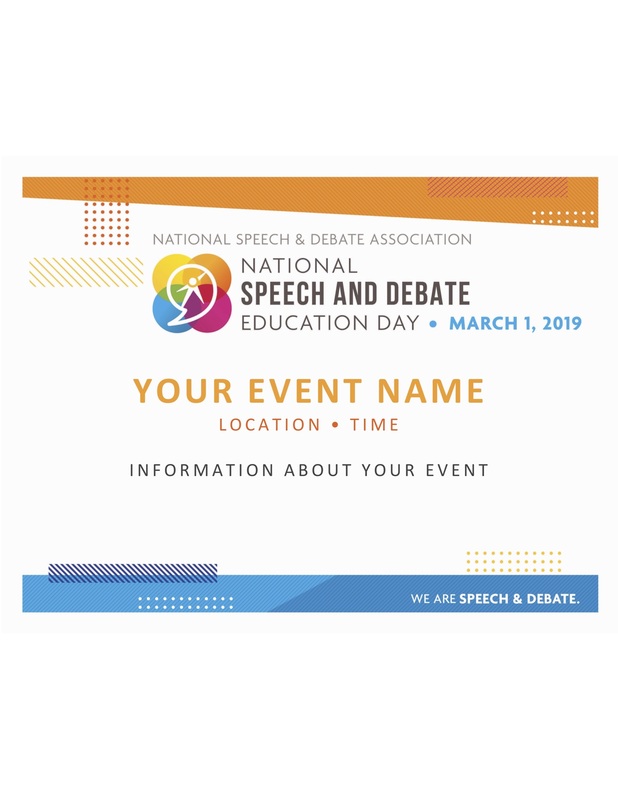 Invite teachers, students, parents, friends, administrators, and school board members to come see the team perform and talk with students and alumni about the value of speech and debate. 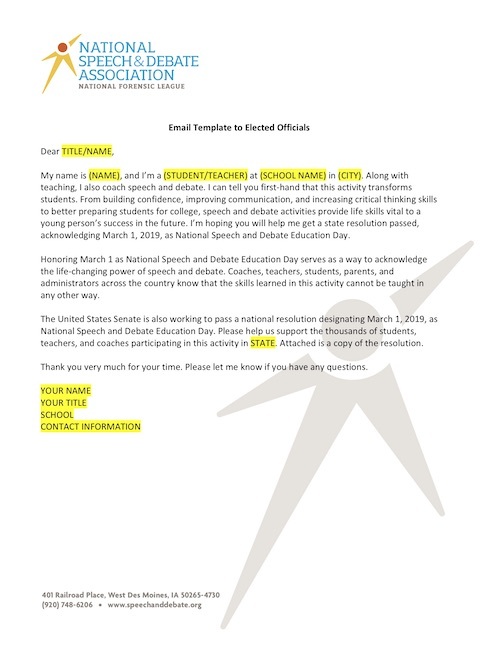 Use this custom template to invite guests to your National Speech and Debate Education Day event! 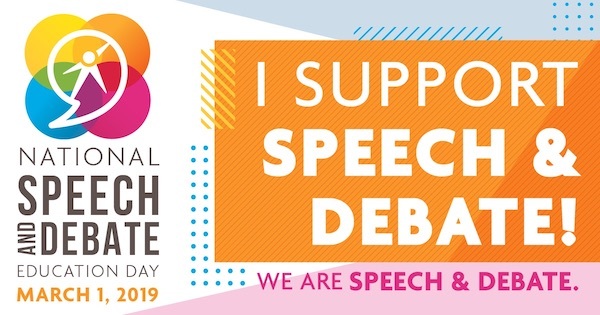 Be sure to use the hashtag #WeAreSpeechAndDebate when sharing your event on social media. 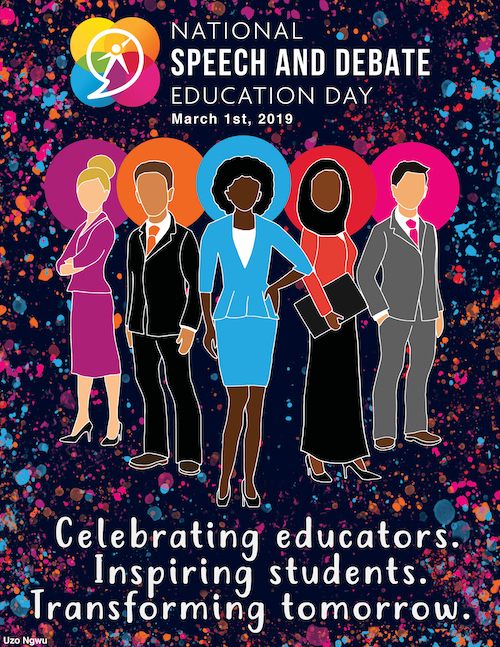 You can also download our printable posters to spread awareness of the day around your school and community, including this year’s student poster contest winner, designed by Uzo Ngwu from Apple Valley High School in Minnesota! In 2018, we worked to secure more than 40 state and local resolutions to spread awareness about our activity. We are thrilled to have so many representatives willing to sponsor legislation in support of speech and debate activities! 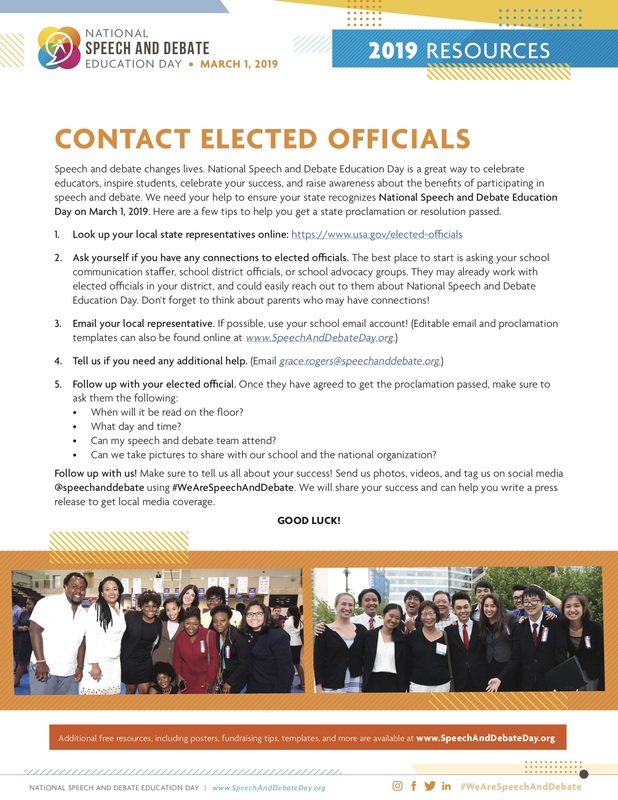 If you have leads or connections that could bring a resolution to the floor of your state legislature, school board, or local municipality, please email Mike Rieker. 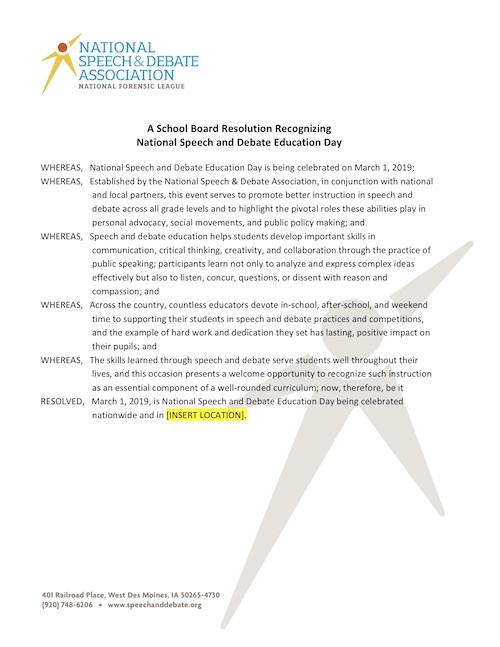 If you’re ready to get the ball rolling, download our resolution templates with helpful tips for passing a state or school board proclamation! 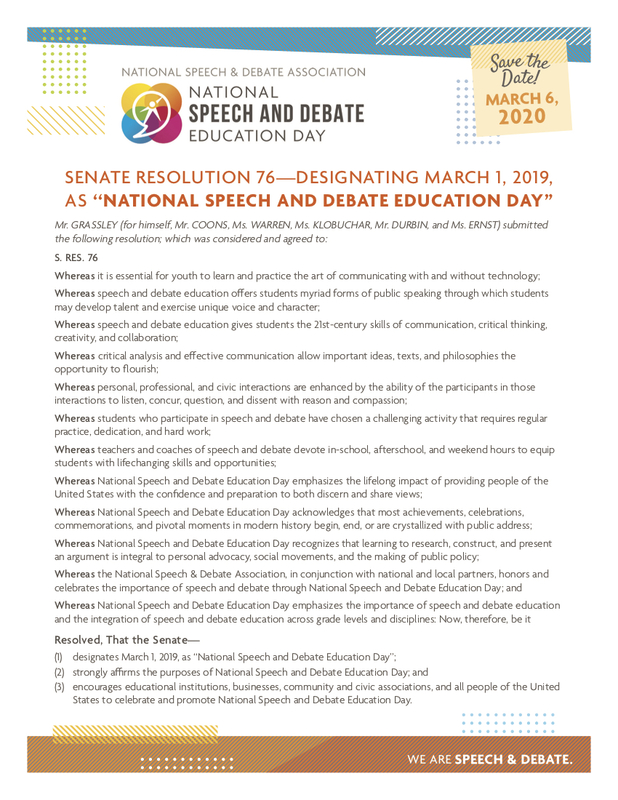 S.Res.76 – Designating March 1, 2019, as “National Speech and Debate Education Day”..
(3) encourages educational institutions, businesses, community and civic associations, and all people of the United States to celebrate and promote National Speech and Debate Education Day. Is your team planning to celebrate National Speech and Debate Education Day 2019? Complete our sign up form and we’ll send you more information! Select someone to be your NSDE Day Captain, and we will work with them directly to ensure NSDE Day is a success at your school. This could be you, or you can designate another coach, student, committee member, parent, or school administrator who can take the lead on your team’s behalf. 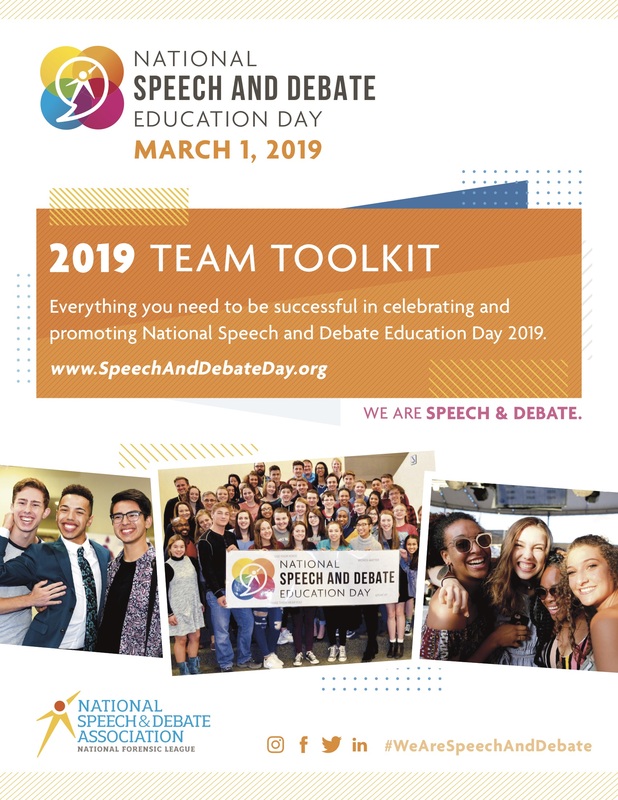 This year, every team that signs up to celebrate NSDE Day will receive a toolkit with information, resources, and FREE swag! We appreciate all that you do and look forward to supporting your team’s efforts. Get started below! 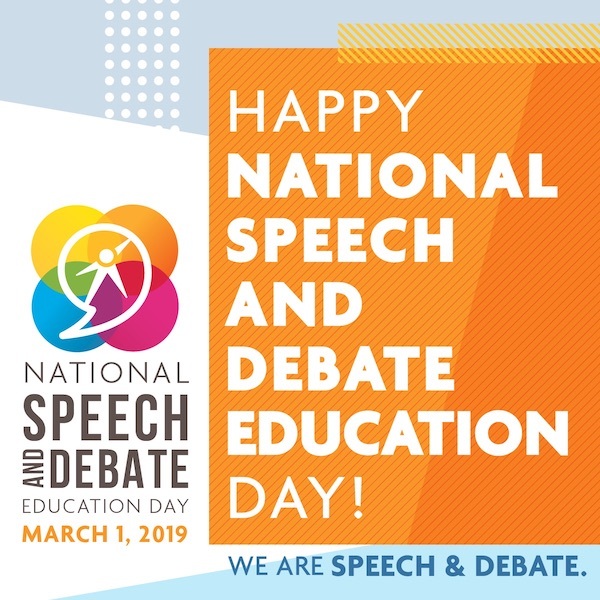 National Speech and Debate Education Day is an important celebration for the speech and debate community. Together, we are celebrating educators, inspiring students, and transforming tomorrow. Click here to see how we’ve recognized this special day in recent years.